American Standard has been in this industry for long, and they are known for their high-quality and high-efficient toilet designs. Unlike Toto toilets and Kohler toilets, the American Standard toilets are slightly cheaper but still perform at a very high level. If you want to upgrade to a powerful and high-efficiency American Standard toilet like the Optum Vormax, then you should try out the American Standard Vormax plus two-piece toilet. If you want a one-piece toilet, then look at this American Standard Ultima Vormax review. The Vormax Plus is a self-cleaning toilet that freshens the bowl every time you flush the toilet. Vormax plus combines with Lysol and the powerful VorMax flush hydraulics, to bring a unique cleaning experience with just a single flush. Read this American Standard Vormax Plus reviews to know more about this toilet. The Vormax plus toilet is easy to install as it has a 12-inch rough-in and it is a two-piece design. Installing this toilet will help you save water as it only uses 1.28 GPF. The toilet is very comfortable as it features an elongated bowl design and it is AD compliant. These and many other features of the Vormax self-cleaning toilet have been discussed further in this review. When you install this toilet, you will say good bye to smelly toilets and you won’t have to scrub hard to get a shiny look. 3 Summary : Why buy American Standard Vormax Plus Toilet? The VorMax plus two-piece toilet is a nice toilet for the money as it offers lots of amazing features. The toilet is constructed with vitreous china material, which is long-lasting. It has the toilet tank and bowl separate, which makes the installation process to be easy. In addition, it has a standard rough-in of 12-inches which is common in the latest homes. So, no need for contacting the plumber as you can setup the toilet by yourself. One of the features that separate the Vormax plus toilet from other toilet brands is its two VorMax Plus FreshInfuser packs, which are included in the purchase. The VorMax jetted scrub together with the Lysol function hand-in-hand to keep the toilet bowl clean and smelling fresh. This can be as well attributed to the self-cleaning toilet that freshness the bowl after ever flush. With this system in place, you won’t have to constantly scrub the toilet as it will clean itself effortlessly. The VorMax flushing system alone cleans 2 times better than standard toilets with just a single flush. This efficient flushing and cleaning system ensures that no staining or buildup is left behind. Moreover, the toilet bowl is made of an everclean surface, which prevents the development of odor-causing mold, mildew, and bacteria. Also, the cleaning compartment is well concealed behind the toilet seat and is easy to access. The best part of all is that the flushing system only uses 1.28 gallons per flush. In the end, you’re able to save water and get a discount on your water bill in some states. At the same time, you keep the environmental clean by minimizing water misuse. Another feature that I almost forgot about the VorMax Plus two-piece toilet when it comes to keeping it clean is the CleanCurve rim. The CleanCurve rim design helps in eliminating concealed, hard-to-reach areas where dirt and other debris tend to hide. Using the toilet is also easy as it is of a chair height. Thus, different people can utilize the toilet without straining a lot. Also, it has the trip lever located on the left side, which makes to be ADA compliant together with the standard bowl height. The elongated bowl design offers more sitting space and the slow close seat ensure that people in the house are not distracted by the slamming. Installing the toilet is one of the easiest things as discussed earlier. The toilet is a two-piece design, has 12-inch rough-in and things like the toilet seat, bolts, and wax ring are included for east and quick installation. With a limited 10-year warranty, this is a toilet that you can spend your hard earned cash on and you will not regret making the decision. It will simplify your work as scrubbing the toilet will be minimized. You will only have to purchase another VorMax plus fresh infusers to keep the toilet clean and smelling fresh. Summary : Why buy American Standard Vormax Plus Toilet? The dual flush valve has been reported by many users to cause leaking. The Vormax Plus tall height two-piece toilet is a high performance toilet model with outstanding features. The toilet features a powerful flushing system in the VorMax jetted scrub with Lysol to keep the bowl clean and smelling fresh most of the time. It is also comfortable as it has a chair height bowl and it is elongated to provide the needed comfort. Made from vitreous china material, this is a toilet model that will last for a long time. You will also end up saving on your water bill as it only uses 1.28 GPF. Install this toilet in your bathroom or public restroom and let it do the work. With a 10-year warranty, this is a worthy investment. I have explained everthing in this American Standard Vormax Plus reviews that you should know. Question: What is the difference between a 10-inch and 12-inch toilet rough-in? Answer: Normally, there are toilets which need a 10-inch rough-in, a 12-inch rough-in, and a 14-inch rough-in. To know the rough-in dimensions, measure from the middle of your toilet bolt holes to your wall. 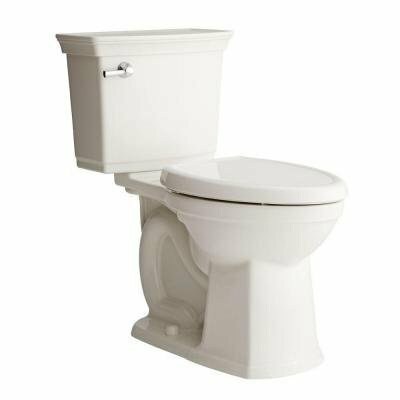 A good number of American standard toilets are made with a 12-inch rough-in. However, if you are not able to install a 12-inch rough-in toilet where you lack enough space of installing your tank onto the toilet bowl due to the wall being an obstacle, a 10-inch rough-in may be the solution. And if there is a lot of space between the back of your tank and the wall, then you should install a 14-inch rough-in toilet. Question: The toilet tank is not sitting in place? What should I do? Answer: In case the tank is wobbling, remove the tank cover and put a level across the top of the tank. Then, pull the tank down evenly and attempt to level it out. With the help of a screw driver, hold down the bolts securely and turn the nut with a wrench a quarter to the left and a quarter to the right. Do not turn the screwdriver again and go from side to side until the tank is secure on the bowl and in position. Still, have a question after reading this American Standard Vormax Plus reviews? Comment below.